Can you believe that despite being a fan favourite for over 25 years, there’s never been a traditional Kirby platformer title released in HD? 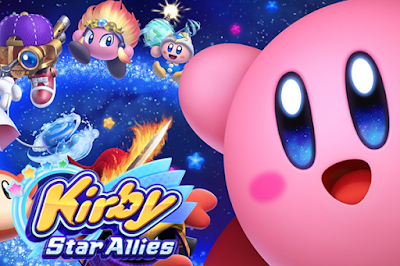 Like most of us, the pink blob skipped on the Wii U and finally finds himself getting long overdue graphical upgrade in Kirby Star Allies, available on the Nintendo Switch. But pixel prowess aside, will the classic gameplay hold up in 2018? Will I ever find out what Kirby actually is? Read on to find out. What makes Kirby Star Allies stand out from other recent platformers released by triple-A publishers is its heavy focus on local co-op. Up to four players can jump in and out of gameplay seamlessly, with players 2 to 4 taking the role of former enemies, who have been brainwashed by big cartoon hearts (it’s Nintendo, just roll with it). In a culture when gaming is becoming more isolated, this really does harken back to a time in which gaming was a more traditionally social pastime. What’s more, the HD treatment of Kirby is nothing short of brilliant. While obviously not trying to match the technical superiority of the Xbox One of PS4, Nintendo have worked their magic yet again to create a game that is as charming as it is vivid. If I were a decidedly more ‘weeb-ish’ individual, I’d describe it as kawaii. With that being said, the amount of bombastic action can make it hard to keep on top of what’s going on on the tablet screen; a problem that is exacerbated with more players. My advice? If you’re playing with friends, keep it docked. However, if you do decide to break out multiplayer (you really should), be aware that there’s a slight imbalance between player 1 and 2 to 4. Player 1 assumes the role of Kirby, with everyone else taking brainwashed foes; only Kirby can use his traditional arsenal of sucking and shooting enemies, likewise only his death will result in being thrown back to the last checkpoint. Although this could lead to the age-old squabble of who gets the first controller, for parents looking to share classic games with their kids, it does negate the necessity for everyone to know all the nuanced controls for Kirby. Finally, the nostalgic appeal of the game is almost to a fault, as there’s not much to be found that hasn’t existed in previous Kirby titles. The first two worlds, Grass Land and Planet Popstar will be remarkably familiar to longtime fans of the series, and co-op multiplayer has been a feature of the series for over 10 years. If anything, Kirby Star Allies works to reacquaint fans with the franchise, but the next title must be more of a departure. Kirby Star Allies is one of the most engaging, true multiplayer experiences of the year so far, and is a delight for old and new fans of the franchise alike. It certainly doesn’t tread any new ground, but for Kirby’s first title on the Switch, it’s still enjoyable to get to grips with the pink blob all over again.